The form that corporate worship takes varies across denominations, and within churches of the same denomination. In some places, the form and shape of worship has become a reason for disagreement among Christians within the same fellowship; often because the concentration has been upon outward ‘appearance’ such as the type of music used. In this book, Castleman takes us through the biblical and historical patterns for worship to help us understand the theology behind what we do, as God’s people, when we meet to corporately worship him. Her stress is upon the need to have the story of salvation at the heart of worship. Our worship should be a reminder that we are part of a wonderful story of redemption and should be a reenactment of that story. 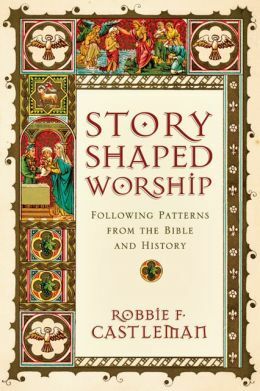 As she says “Worship shaped by God’s great story is a rhythm of promise on a journey of faith” (p 204). This story is something that should not only guide individual acts of corporate worship, but also the life of worship over the year. For those of us who come from evangelical traditions where the older forms and patterns of worship have been thrown out and replaced by more ‘contemporary’ forms, it is a timely reminder that worship can never be – and must never be – about meeting our needs–worship must be about bringing glory to God. Castleman encourages us to ask questions about what our intention with worship is, and what god it is that our present services invite us to worship. If our concerns are about style, pleasure, or personal satisfaction and fulfilment then we are not worshipping the God of the Bible. This is a book that contains gems in every chapter (I blogged on one of these earlier, here) and Castleman supplies questions and discussion topics at the end of each chapter as a spur to further thought. Chapter four, “The Shape of Biblical Worship,” would be especially useful for anyone involved in assessing their church’s worship services with an aim to changing them to more closely reflect biblical patterns and priorities. A highly recommended book.